In my liturature class at Western New Mexico, I have a number of assignments that I do. This week we were required to make a poster of a childrens book. Something that would stimulate an interest in the book, and then we then had to present it to children at a school. 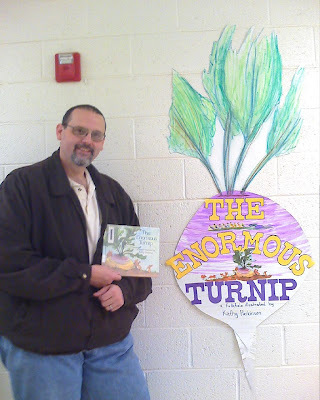 I designed my poster around the book The Enormous Turnip. It is a Russian folktale that I am very familiar with because there are a number of variations on the story, you could spend a good week reading them all to kids, and doing related projects around the stories. Well since I put in the work and made the poster, I decided to show it off. I was pleased with my results. You are so talented. I love you. Great job on the poster. An A+++++.